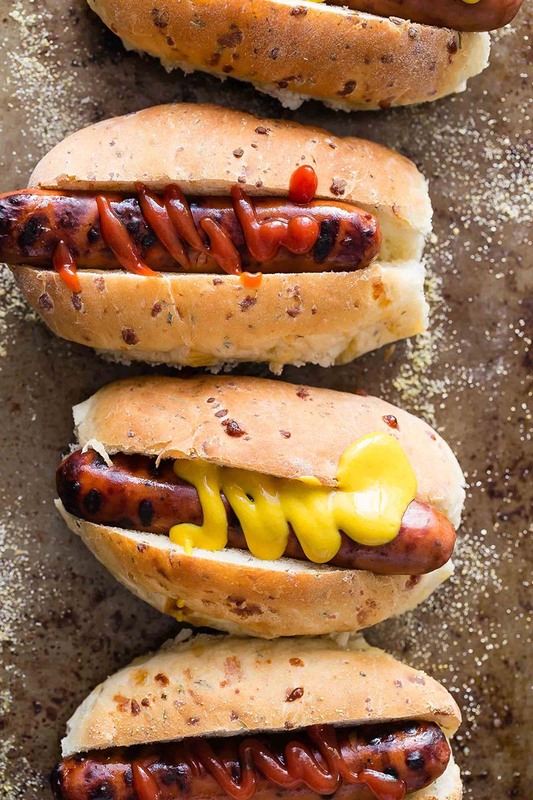 Fresh baked cheesy homemade hot dog buns with fresh rosemary and sage for added flavor. So easy to make and taste way better than store bought. In a large bowl mix the water and yeast until the yeast is dissolved. Add the sugar and egg and mix well. Mix in 2 cups of the flour until no lumps are visible. Cover with plastic wrap or a clean towel and let rest for 45 minutes. After resting, add the salt, melted butter and olive oil. Mix to combine, and then add the remaining 2 cups flour, cheddar, rosemary and sage. Using a wooden spoon or your hands, mix the dough until it forms a ball and comes away from the sides of the bowl. Turn the dough out onto a well-floured surface and knead for about 5 minutes. Place the dough ball into a lightly greased bowl, cover with a towel and let rise for until doubled in size, about 1 hour. After rising, punch the dough down and divide into 12 equal pieces. Press each piece flat into a rectangle shape and roll tightly into a log shape, pressing heavier at the ends as you roll for a tapered finish. Each bun should be about 4 to 5 inches long. Dust a baking tray with cornmeal and place the rolled buns in rows of 4 by 3. Cover the tray with a towel and let rise for about 1 hour. Preheat the oven to 375°F. Bake in the oven for 20 minutes and golden brown.